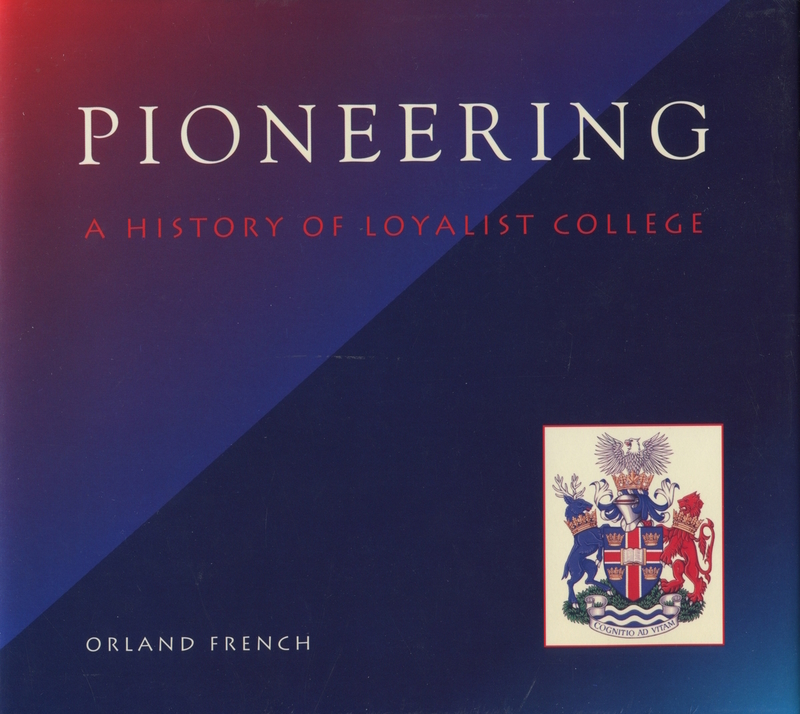 The excerpts below are from author Orland French’s book, PIONEERING: A History of Loyalist College (1992). While some references are no longer current, the publication provides a rich report on Loyalist’s history, which helps to contextualize its milestones. 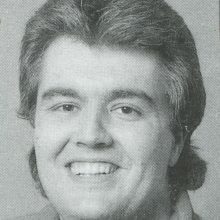 Lorne Johnston was a friend of Loyalist College even from the beginning. With sentimental family ties to the Belleville area, he had a special interest in seeing the Quinte Region acquire a college campus. His efforts were acknowledged when the College officially opened. Johnston received the first honorary diploma to be awarded by an Ontario community college. When the Pioneer building was opened in 1968, the guest speaker might have taken solace in a popular song of that decade. His words of wisdom, committed carefully to paper, were literally “Blowin’ in the Wind”. He graciously invited the press to pick his notes out of the trees if they wanted a prepared text. The day Bill Davis came to town was supposed to be “a real blast”. And it was. But only after an uncomfortable warm wait on a hot August afternoon in 1969. 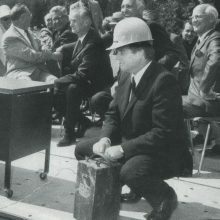 Loyalist had decided to begin the construction of its permanent building with a sod-blasting ceremony rather than the more sedate silver spaded sod turning. 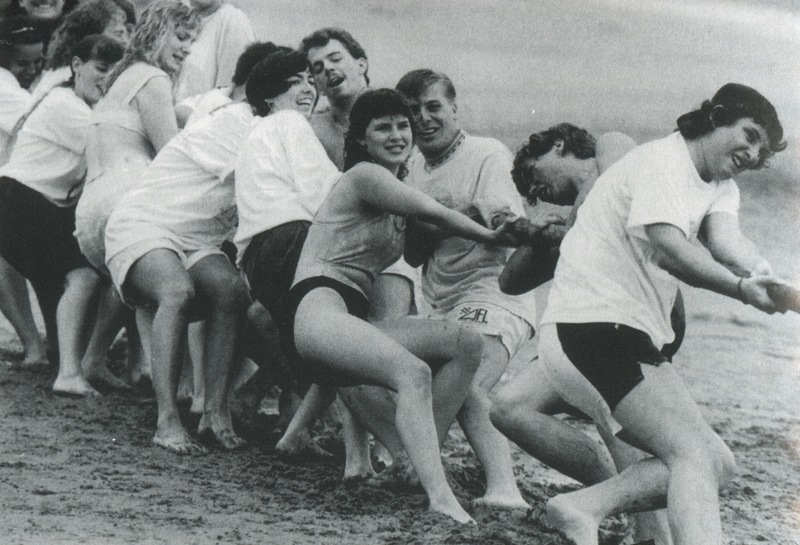 The first graduates of community colleges suffered an identity crisis. No one knew for sure what the colleges were capable of producing and students were aware of this uncertainty. The new colleges would not provide the academic training of universities but they were more than trade schools. They were a new breed of post-secondary education intended to provide the training and skills required by the rapid developments in technology. But colleges had yet to prove themselves. The original Loyalist logo, incorporating a stylized form of the letters LC to signify the lamp of learning, was derisively dubbed “the pregnant seagull” by staffers. When the 10th anniversary symbol was unveiled, many staff members embraced it as a new logo. But the Board of Governors ruled that the old logo would stay and the new symbol would become a “crest” for the College. Not insignificantly, the new colour symbol would have cost an additional $1,500 in printings costs for College stationery. The 28-foot pylon at the entrance of the College was erected in 1975 to assist confused motorists who couldn’t easily find the main entrance. Pre-construction publicity said the pylon should be clearly visible from both Highway 401 and Highway 2. This may have been a tad over-enthusiastic. There’s no shame in saying you got into Loyalist College through the back door. The front door is still waiting for the road to arrive. The Kente building of Loyalist College was built facing southeast in anticipation of the extension of Bridge Street to Avonlough Road. A road system which never materialized was intended to connect the College to Avonlough Road to the east and permit ready access to downtown Belleville and Prince Edward County. Consequently, Loyalist presents its best face to the field and the forest behind it. From Wallbridge-Loyalist Road, visitors approach the College which appears to be housed in a long, low, one-storey building. They seldom see the seeping lines of the three-storey structure or the shimmer reflection of the glass-fronted lobby, as the architects intended. After 25 years, the road to Avonlough is still a planner’s dream. Across Canada and around the world, there are 12,000 people who can attest to the strengths and purpose of Loyalist College. They are not the teachers or the administrators, nor are they the government bureaucrats who determine the educational directions of the college system. These are the students who have graduated from Loyalist College over the past 25 years. Three Loyalist students covered nearly 9,600 kilometres of bush road and trails in the backwoods of eastern Ontario in 1974, creating a promotional film for the Moira River Conservation Authority. Tom New, Jan Zuchlinski and Maureen Hainje worked through the summer to produce a 15-minute film called Moods of the Moira, which was accompanied by a soundtrack of music by Moe Koffman. Perhaps inspired by the movie They Shoot Horses, Don’t They? 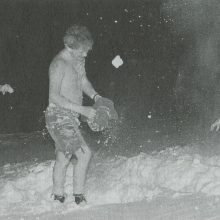 Loyalist students staged a dance marathon at Club Cedars in 1971. Men in ankle spats and women in flapper dresses danced to the music of the ‘20s provided by Kid Bastien’s Carmelia Jazz Band of Toronto. Fourteen couples began dancing at 9:00 p.m. and eleven were still going at midnight. Two hours later, only Sue Nagy and Tom Dekeyser were still on their feet – winning a trophy and a prize of a dinner for two. Thanks to Radio Broadcasting professor Steven Bolton, Canadian Forces personnel serving in the Gulf War got sounds from home over the 1990 Christmas season. Bolton organized shipments of radio programming from local radio stations to send to the Persian Gulf. Forty-three radio stations from across Canada contributed more than 138 hours of hometown news and information, talk shows, local gossip and special greetings from family members. Col. J. Kenneth Bradford was hired in June 1967 to oversee the creation of a college. And quickly. Bradford was to have the College “up and running” within three months! The College was initially located in rented space at Centennial Secondary School in Belleville. Soon the College acquired land on Wallbridge Road, built the Pioneer building and opened for classes. Bradford had distinguished himself in World War II as Lieutenant Colonel and Corps Commander. 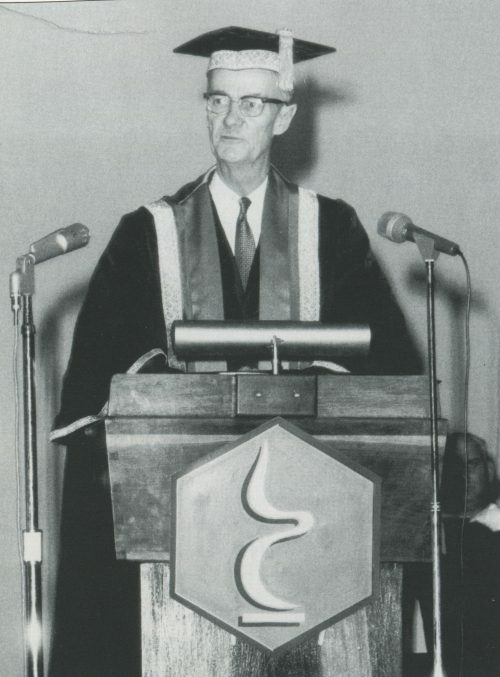 Judge J.C. Anderson, prominent in the Quinte Region, was a strong advocate of bringing a college to the Belleville area. When the joint Board with Sir Sandford Fleming College was created, he was appointed Vice-Chairman to represent the Loyalist campus. The Board was headed by the Reverend Henry Joseph Maloney of Bancroft. Later, when a separate Board was created for Loyalist, Judge Anderson was named its first Chairman. He was a key figure in the site selection and building design of the College. Judge Anderson’s efforts have been honoured with the naming of the College library as the Anderson Resource Centre. Herbert Young brought to the President’s office an impressive list of credentials as an executive officer of a number of companies. He knew his way around the executive offices of Duplate of Canada in Oshawa, The Fiberglass Company of Canada in Sarnia, and Woods Gordon and Company, a large consulting company. He was also president of Dominion Forge of Windsor and Welmet Industries of Welland, a steel specialty manufacturer. 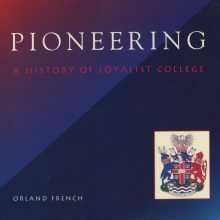 Young’s role was to weld the rips and tears in the Loyalist shell and forge the College into a dynamic institution. 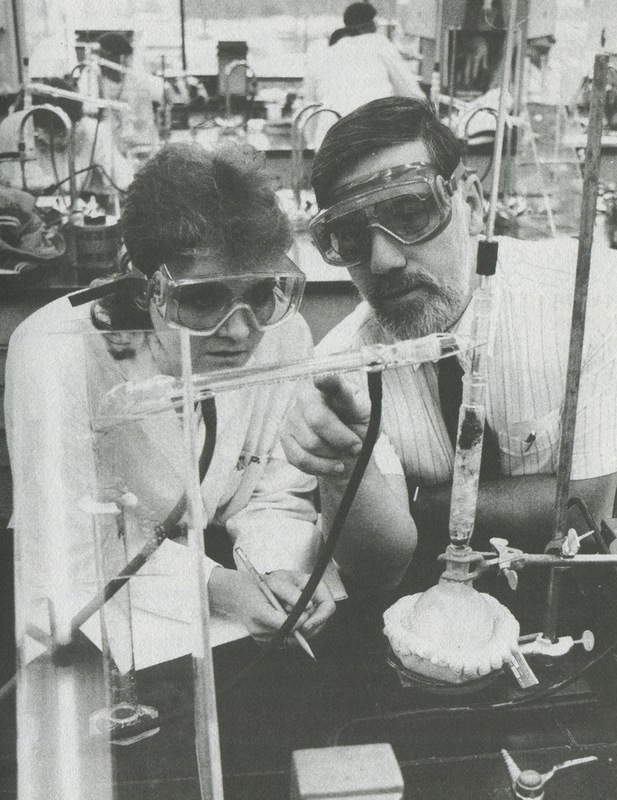 Before his appointment to the President’s office, Dr. Douglas Auld served as Executive Dean and Principal of Sir Sandford Fleming’s School of Natural Resources. Earlier, he had served as chair of the University of Guelph’s Economics department. Auld said he had been attracted by the College’s “outstanding reputation and its high-quality programs”. The messages of politicians, poets and prognosticators have please and provoked Loyalist students and staff over the years, offering insights into the breakup of Canada, the breakdown of society, the decline of affluence, and the increase of effluence. 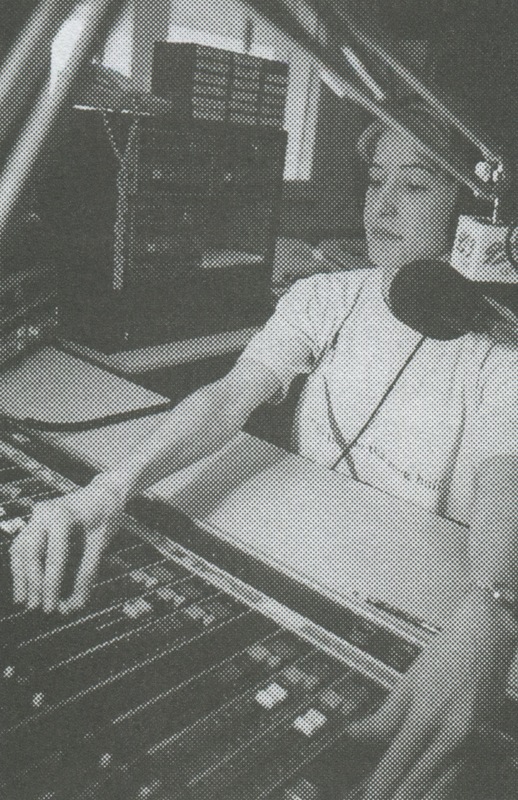 Loyalist’s Broadcast Radio program was so successful in the early 1980s it couldn’t keep students in the classroom. 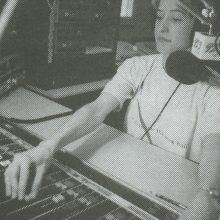 Radio professor Bryan Olney, later dean of media studies, said that the radio industry snapped up first-year students who then did not return for second-year training. “In most cases, the radio stations came looking for employees and the students didn’t have to apply,” Olney said. By Loyalist’s 25th year of operation, students could get money on campus from two locations: the Student Loans office and a “hole in the wall” known as an automatic teller. 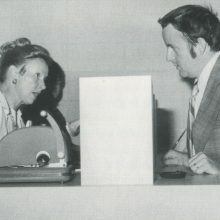 On-site banking arrived at Loyalist in 1974 when the Bank of Montreal opened a branch managed by Mrs. Helen Melbourne. No electronic beep-beep was heard there; the teller was a real person with a live human voice. 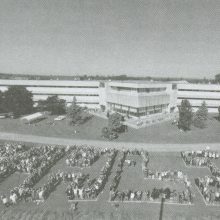 Labour disputes and strikes have occasionally marred the first 25 years of Loyalist College, as negotiations with teachers as well as support staff came to an impasse. 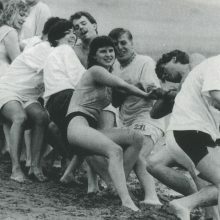 Teacher strikes in 1984 and in 1989, and a support staff strike in 1979, were the low points of labour-management relations in the college system. “I guess the life of a girl at Loyalist isn’t too bad. I suppose it is better to be thought of as ‘one of the guys’ rather than being looked down on as being a lesser member of college society. Metamorphosis, a five-foot statue of a woman’s form breaking free of bonds, was unveiled in the Anderson Resource Centre in May 1989. The sculpture, by artist Audrey McNaughton of Oakville, was presented as a gift. “The sculpture depicts the ongoing struggle for freedom of mind and body,” said McNaughton. “It’s symbolic of humankind’s struggle to attain its rightful heritage”. —Women’s advisor Karen Fraser in a lecture at Loyalist titled “Getting Yours”, January 1976. A group of first-year college students came the ultimate landlords of Belleville in 1978. For a few moments, they owned the entire city. It was their prize trophy in a scavenger hunt on the College’s orientation day. Mayor Ben Corke agreed to sign over the entire city, then worth about $800 million, if they agreed to give it right back. They did. The wings of the Kente Building were not always named after the counties served by the College. As they were constructed, they were assigned letters of the alphabet: “A” building, “B” building, etc. In 1973, the College decided to give the buildings names with a local historical flavour. Among names submitted for what eventually became the Pioneer building were: Lower Loyalist, Quinte(variation Kente), Erie Hall, Tyendinaga Building, and Lancer Lodge. Wallbridge Road gained its hyphenated addendum of Loyalist after lobbying by the board of governors. Animals have been banned from campus since the College was set up. The only exceptions are rabbits and guinea pigs, which delight children in the Early Childhood Education Centre, and guide dogs for blind students. 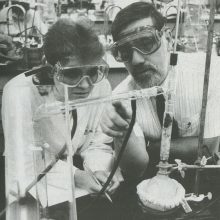 Queen’s University, a much older institution followed Loyalist’s example and banned animals in 1975 after it had to fumigate Theological Hall for fleas. The Moira River claimed a student’s life in April, 1972. David Thompson of Wellington drowned in the fourth – and last – “river run” when his raft went over Lazier’s dam. His companion, Garnet Bowers, was rescued. The two Loyalist third-year technology students entered the Moira River Raft Run unofficially and tried to beat the river in a raft that did not satisfy organizers. Books no longer walked out of the library “on their own little legs” after an electronic security system was installed. The Anderson Resource Centre set up an electronic security system in 1974 after an inventory had discovered that 1,314 books had gone missing in action since the last inventory in 1971. The security system sounded a “gotcha” gong whenever someone tried to slip out of the library without properly checking out a book. The embarrassment of being caught was usually considered punishment enough. 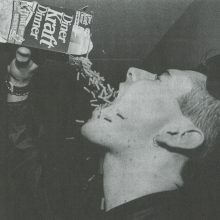 In the days when a buck was a buck and not a looney, lunch could be had in Club 213 for a few dollars. A 1972 menu offered main courses: Poulet Saute au Vin Blanc ($1.60), steak ($2.00) or Pork Loin Provincale ($1.60). A seafood crepe appetizer was 45 cents. Dessert selections cost 25 cents. A drink from the bar cost 75 cents, while a whole bottle of an imported Yugoslavian wine could be bought for $4.50. A popular attraction was the $2.50 Friday buffet. At one time there was an annual ritual in which Hotel students in Club 213 “killed the haggis” on Robbie Burns Day. But it did no good, for the haggis always returned for slaughter the next year. Winters are the worst for Loyalist’s smokers. Huddling in doorways, turning their faces away from the wind-driven snow, they fight to avoid freezing their “butts” in an ever-expanding smoke free environment. Established as a community college, Loyalist provides educational services to the counties of Prince Edward, Hastings, Lennox and Addington, and part of Northumberland. Add to that Nigeria, Venezuela, Botswana, Germany, Japan, Cuba, El Salvador . . .
Students with special needs found doors opening for them in 1988. A door at the main entrance to the Kente Building, one in the Quinte Industrial Training Centre and one in the Pioneer Building were fitted with sensors which, when activated, opened the doors automatically, Funding came form a grant from the Ministry of Colleges and Universities. The doors were part of ongoing retrofitting by the College to broaden accessibility to people with special needs. Wheelchair ramps were installed and a second elevator was built in the Northumberland Wing in 1992. Photography teacher Val Baltkalns dedicated one of his pictorial landscapes to Terry Fox, the one-legged runner who eventually lost his life to cancer. Baltkalns, a Fellow of the Royal Photographic Society, died in 1992.